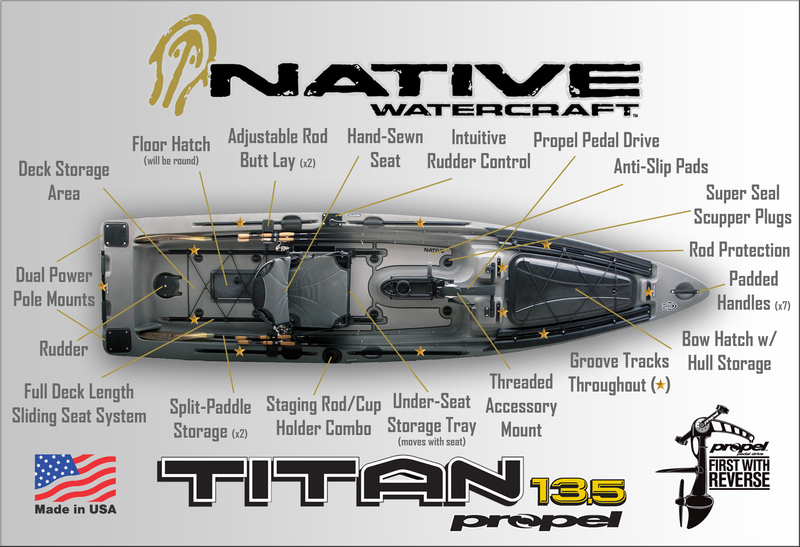 Native Watercraft Titan Propel 13.5 tax free at Delaware Paddlesports! Delaware Paddlesports is excited for the Native Water Craft Titan. The Titan is a “First with Reverse” Propel Pedal driven bass boat extraordinaire. Large and in charge, the Titan offers unsurpassed stability and ample room and flexibility to move around. Optimal for sight casting with plenty of leverage to reel in the catch, this is a fisherman’s fantasy fulfilled. This boat features easy-to-reach horizontal rod storage with rod tip protection. Elevated First Class Seating is designed for comfortable transitions between standing and sitting, and it can be moved out of the way for a walk-around deck. The boat also features two stern Power Pole mounts for dual anchoring to further increase stability. The Titan can be purchased with a custom motor mount that will accept trolling motors for a power-assisted ride. The image above displays some of the many features found on the new Titan. The Titan will be available at a DPS March/April 2017. The colors offered will be Hidden Oak, Lizard Lick and Copperhead. Current specs are… Length: 13′ 6″, Width 41.5″, Weight: TBD, Capacity: 550 LBS. Retail Price is currently slated at $3,249 USD with the super quiet Propel Pedal Drive System, $3,338 USD with Transom-Style Motor Mount Included or $2,489 USD without the Propel Pedal Drive. Note: Shipping price is only good for the contiguous United States. Non U.S.A please call for shipping quote.